Then she hits on a new tactic, which is basically a judo move — using Woodard’s own distrust against him. She sighs, and looks off into the distance. Julia: Oh, in a way, I don’t blame you. I’m getting… a little impatient myself. Woodard: What do you mean? Julia: I’m sorry to say, I’ve made almost no progress at all. Woodard: You mean you haven’t come across anything? Woodard: I’m sorry to hear that. I know you had great hopes. Julia: Well, maybe I was wrong. Woodard: You know, that doesn’t sound like you, Julia. Julia: Oh, it’s me all right. So you can see why I haven’t been giving you any reports. Woodard: Are you telling me the truth? Woodard: Are you sure this isn’t just another tactic to get me to stay quiet and keep out of the way? You know something. I know you do. She’s playing him like a fish. It’s amazing. Julia Hoffman was born to lie. Woodard finally agrees that Maggie can stay at Windcliff for a while. He’s about to leave, when somebody knocks at the door. Vicki comes downstairs to answer the door, and there’s a funny moment when she stops in the foyer to say hello to Dr. Woodard, and for a minute, it looks like they’ve completely forgotten that there’s someone waiting outside. There’s a couple minutes of hellos and goodbyes, and when the dust settles, we’re left with Vicki and Barnabas talking in the foyer. She’s decided to give Josette’s music box back to Barnabas, because she can’t seem to stop playing it. On his side, he’d like her to keep it. It’s kind of a dull scene, really, so it’s probably all for the best that just at this moment, the studio catches on fire. I’m serious. 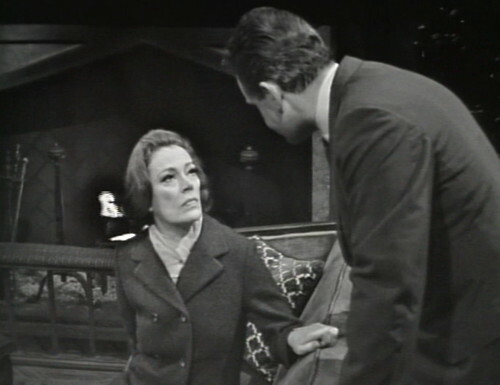 There’s a fire in the studio, right now, while Vicki and Barnabas are having a scene. They don’t stop the scene, because in 1967, videotape editing was difficult and expensive. 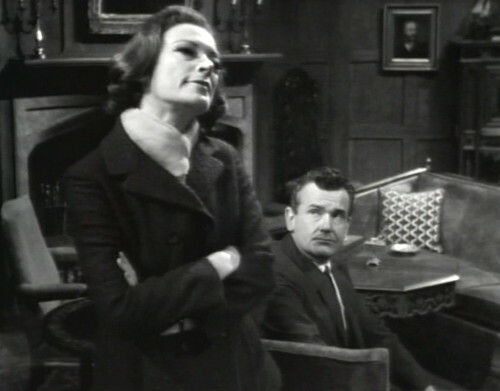 They filmed each episode “live-to-tape” — running through the episode in real time, including pauses for the commercial breaks. That’s why there are “bloopers” listed at the bottom of every post; if somebody forgets their lines, or a sound effect doesn’t work, they just keep the camera running. Today, that means that the actors keep going while something off-camera catches on fire. We don’t actually see the fire, unfortunately, but we hear people coughing, and then the spray of a fire extinguisher. If you’ve never seen this, it’s one of the all-time great moments in television, and you should watch it right now. Here’s a link for episode 290 on Hulu. This scene is at 10:00, just before the second commercial break. 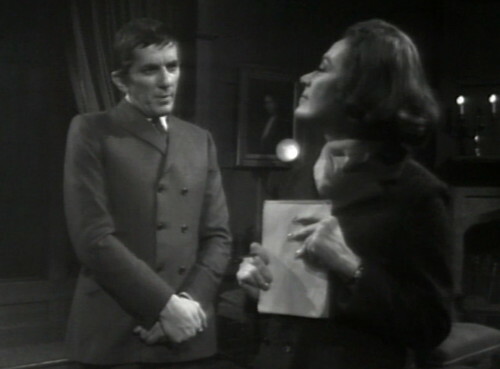 Now, Jonathan Frid often has trouble keeping his lines straight, even on days when the studio isn’t bursting into flames, so it’s amazing that he manages to string a sentence together. It basically sounds like this. Barnabas: Try it, and see. And if after a while, [ off-screen coughing ] that you’re still disturbed by it… then I’ll take it back. [ cough ] And please — [ fwooshh ] — don’t be afraid — [ fwooshh fwooshh fwooshh ] — of what — [ cough cough ] — being trapped [ fwooshhh cough ] by the [ cough ] past means. After all… [ cough ] one should be afraid of… being trapped by the present. And actually, I think that line sounds better this way. It was never going to make a whole lot of sense anyway. They should set fire to the studio more often. There’s a commercial break, they put the fire out, and we get another amazing Julia scene. I know, I’ve spent all week talking about how great Julia is, but she’s a big deal. As crazy as this is to say — if Julia hadn’t shown up, then there was a danger that the vampire storyline was about to get boring. 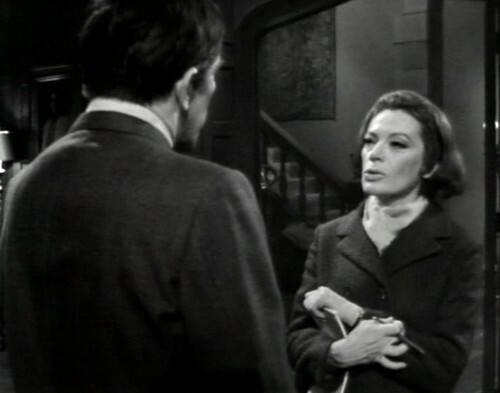 Vicki doesn’t realize that Barnabas is one of the living dead, but otherwise she seems perfectly happy going along with whatever he suggests. He’s come to her bedroom twice now, and both times, he’s chickened out and decided not to bite her. We need something new to spice things up, and here it comes. 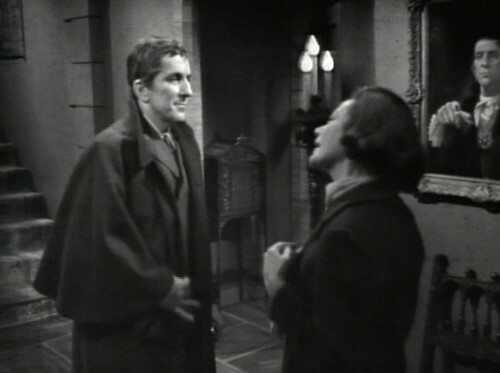 Barnabas starts out by apologizing to Julia for being abrupt with her when she visited the other night. She says he can make it up to her by answering some questions that she has about his “ancestor”. 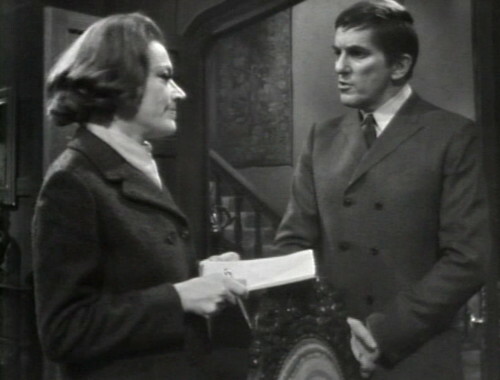 Julia: Of course, the person I really care most about is your namesake, the original Barnabas Collins. Barnabas: A rather dull person, from all accounts. Julia: Oh, then perhaps I’ve uncovered some things that you’re not familiar with. I find Barnabas Collins — oh, not you, of course, the original Barnabas Collins — the most fascinating of all the Collinses. Barnabas: How can you? He went to England when he was very young, and died there almost obscurely. Julia: So the story goes. 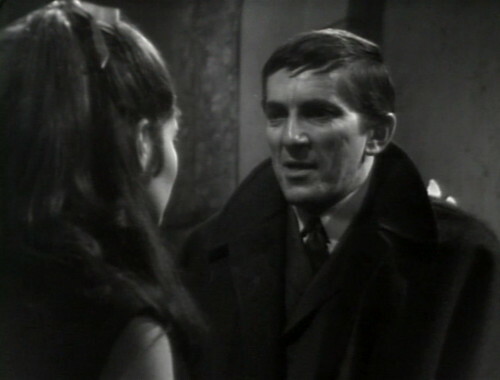 Barnabas: You mean, you’ve uncovered some new facts? Julia: I told you when I first met you that I knew a great deal about… a great many things. 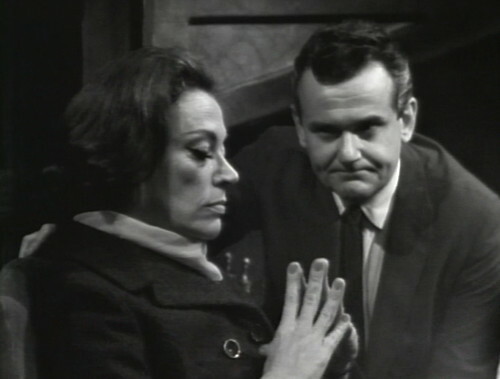 Barnabas: I can’t believe that you really have found out anything startling. Julia: Maybe I have, and… maybe I haven’t. Just a quick reminder: The dude kills people with his teeth. 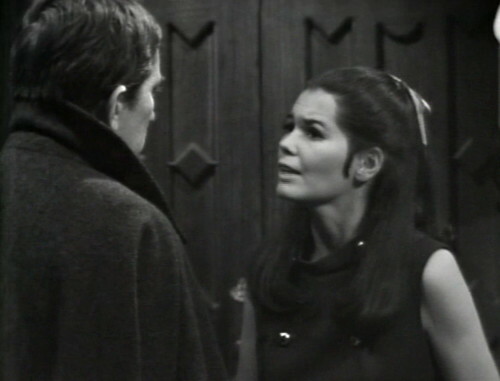 Barnabas: If you’re willing, perhaps we could talk tomorrow, at my place. Julia: I’d like that very much. Shall we say, tomorrow… morning? She arches a couple of eyebrows. Barnabas: I’m afraid that wouldn’t be convenient. Julia: Oh. Well, tomorrow… afternoon, then. Barnabas: I won’t be available until the evening. Now, those are just the edited highlights; the actual scene goes on and on, and gets crazier by the minute. She practically announces that she knows he’s a vampire, and dares him to make something of it. Julia is just burning through story like a forest fire. As we’ve seen, open-ended narrative is the product of an ancient truce between the writers and the audience — we want more exciting things to happen; they want to hold back story in case they need it later. We want Julia to succeed, because killing her would mean no more story progression. That’s the same logic that made Barnabas the central character. So the final scene is kind of intense. 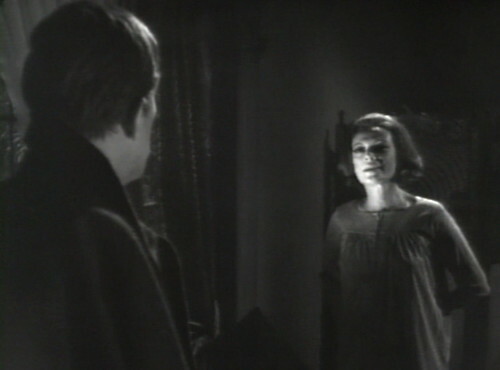 Barnabas waits until Julia’s asleep, and then he sneaks into her room and strangles her. Except she’s anticipated that — there’s a dummy in the bed. She steps out of the shadows and into a shaft of moonlight. And then the entire show bursts into flames, and the ABC daytime schedule burns to the ground. See you Monday. The fire, obviously. Here’s that Hulu link again. This is the last episode written by Joe Caldwell for a while; he’ll be replaced on the writing team next week by Gordon Russell. Caldwell will be back in a few months, filling in for three weeks when Malcolm Marmorstein leaves. a fire in the studio! haha that joys of live taping. Or a vampire who does work for a living…. Julia…slickster of the day. I love how she played all over Barnabas…lol and he is so oblivious to her madness. She is almost laughing at him in his face. Oh my goodness, I’ve just rewatched that scene. It’s hysterical. What makes it even funnier to me is that the first time I watched it, before I read this post, I was hypnotized by Barnabas’s semiarticulate-vampire-on-the-make shtick, and I didn’t even notice all the commotion in the background. There weren’t just fwooshing sounds — there’s banging, as if they’re beating on something. The contrast between watching the scene “straight” and noticing the surrounding hubbub is like sketch comedy. And I’m amazed the actors were able to keep going so well. Water shot out of my nose reading the Barnabas studio fire dialog. So there’s that. Best recap yet! Even with the fire, this is one of the best DS episodes. That ending is magnificent. I knew it was coming and was still held in suspense. Nice lighting in the scene, too. I’m sorry we’re about to go to color. Barnabas has met his match and Dr. Hoffman has found her holy grail. The writers are like that classic Capt Quint line from Jaws “…either very smart or very stupid”. They took a show trying to survive on bland characters and plots with a spooky twist, and put it into the hands of 2 characters dependent on each other although the others survival threatens their own. Brilliant! 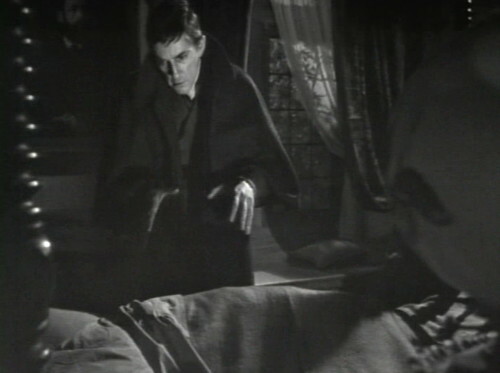 I love the face Barnabas makes when julia goes for her notebook. When Vicki says maybe you can show her your library he turns and gives her a look that makes me think hes not to happy with that idea. 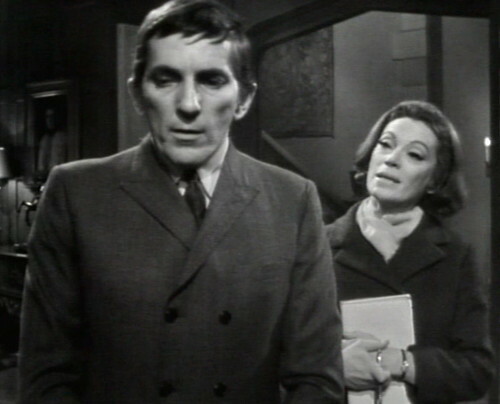 Jonathan Frid’s facial expressions are wonderful, as always. 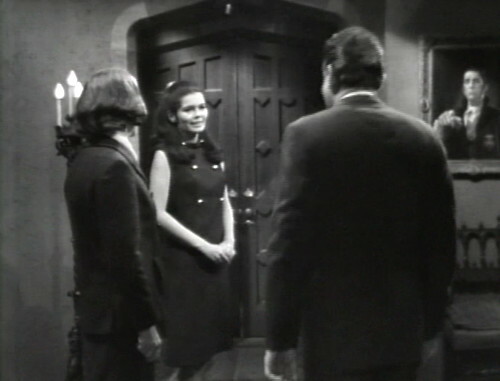 Another brief blooper…Barnabas and vicki are talking in the entryway. 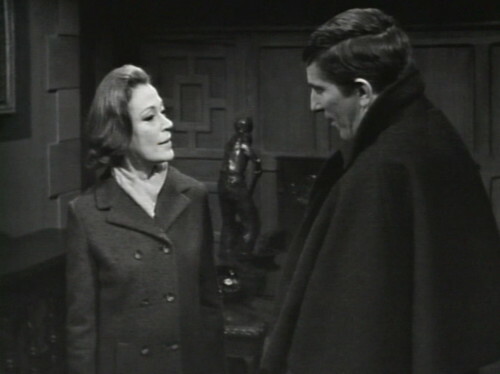 As she is telling him about being not being too excited about the historical work julia is doing and Barnabas’ surprise, you can see someone walking by between the crack of the double doors. If you want to see the scene with fire offstage, check out these bloopers. The scene starts just after 4:50.